Little Common’s footballers pulled off a tremendous turnaround to defeat higher grade opposition on Tuesday night. Dan Estherby equalised for Common in the 90th minute of a close-fought Sussex Principal RUR Charity Cup second round tie before Will Spice grabbed an extra-time winner to seal a 2-1 victory away to Eastbourne United AFC. The match was due to have been played at Little Common Recreation Ground, but was switched to The Oval because of Common’s ongoing floodlight problem, which they hope to have resolved by the end of this week. Both teams tried to play football despite the windy conditions and less than ideal surface. Common kept the ball well during a fairly even first half and looked threatening from set-pieces. Zack McEniry hit the crossbar early on from a well-delivered corner and the same player couldn’t quite make telling contact when well placed in the area. It was a really good win and I’m made up with everybody. Billy Trickett had an effort from another corner cleared off the line, while Matt Cruttwell pulled off a good double save at the other end. Common fell behind just two minutes into the second period, but didn’t let their heads drop and enjoyed quite a lot of the play thereafter, albeit without overly testing the United goalkeeper. With time running out, Common conjured up an equaliser. Common kept the ball following Trickett’s long throw and Estherby, who was a menace all evening, hooked the ball over his shoulder and in off the post. 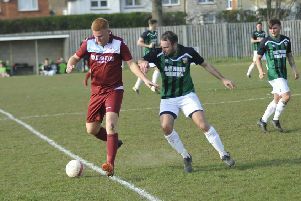 Despite the lateness of their leveller, Common still could have won it in normal time, but Lewis Hole was denied by the goalkeeper with virtually the last kick of the initial 90 minutes. Common started the additional half-hour quite brightly and the winner arrived in the 100th minute via an unlikely source. Spice headed in his first senior goal on his first senior appearance of the season following a good delivery by Estherby. Spice was playing his third game in four days for three different Common teams having also turned out for the thirds on Saturday and under-21s on Monday. Common didn’t really look in any danger thereafter against a United side playing its first game under new manager Tobi Hutchinson. Common defended well, won their headers and put their bodies on the line to secure a home tie against Crowborough Athletic in the last 16. Common: Cruttwell; Sherwood (Spice), McEniry, R. Eldridge, Lusted; Denny, Brown (Feakins), Ammoun, Estherby; Trickett, Hole. Subs not used: Wells, Crone, C. Eldridge.